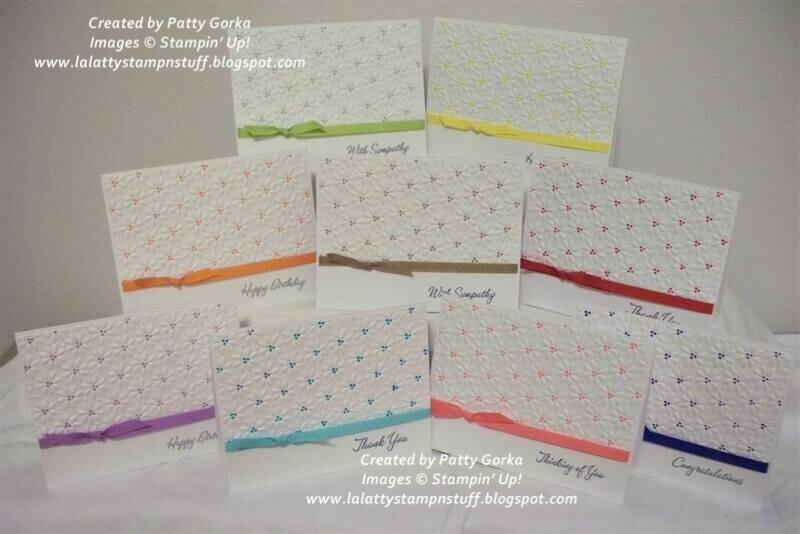 LaLatty Stamp 'N Stuff: My First Blog Giveaway! This week's Splitcoast's clean & simple challenge is a real easy one. If you have time be sure to check it out. The challenge can be found here. 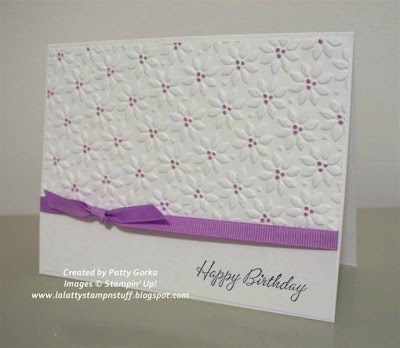 The challenge this week is to create a CAS card using dry embossing. 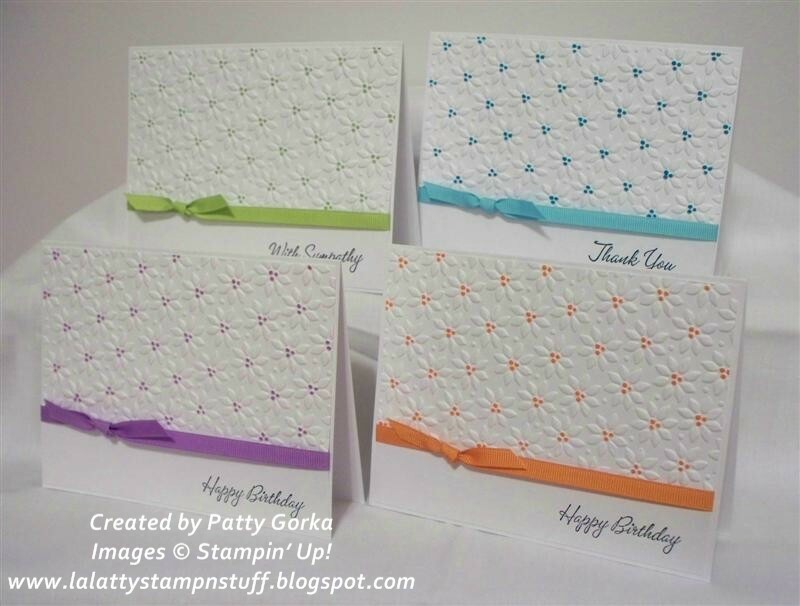 I use embossing on a lot of my cards. It's such an easy way to add that 'wow' factor or to add just a little something extra without over doing it. My cuttlebug is one of my most used tools and I just love it! I originally made one card of these cards and I then I really liked the way it turned out. These literally took only minutes to make, so I decided to keep going and I make an entire set of cards (in different colors). I was planning on doing 3 birthday, 3 thinking of you, and 3 thank you cards, but I ended up using a few different sentiments from SU's Warmest Regards stamp set. I ran the upper portion of my card stock through my cuttlebug machine and then I tied on the ribbon. Next I colored just the centers of the embossed flowers using my SU markers, and then I added my sentiment- so quick and easy! And what am I going to do with all of these cards you ask? Well, I've decided that it's time to have my very first blog give away and the prize will be this set of cards, with envelopes of course. All you need to do to win is to leave a comment for me here in this post (I'd love to have you as a follower as well, but it's not required). I will be drawing a winner one week from today on Monday morning, July 19th. I will contact the winner (and I'll post it on my blog as well) and then I'll get these cards in the mail. Everyone is welcome to play along, I will ship outside of the US. Good Luck and thanks for stopping by! Below is a close up photo of one of my cards. And I have individual photos of all of these cards posted here in my Splitcoast gallery. Hi Patty! What great cards! I always enjoy seeing what you create every day and would love to be the winner of these beauties! So pretty Patty. Now I'm just trying to figure out how you embossed only part of that card front!! This would make a wonderful set of cards. simply beautiful! I'd like to CASE this idea for some holiday gift giving, if you don't mind. 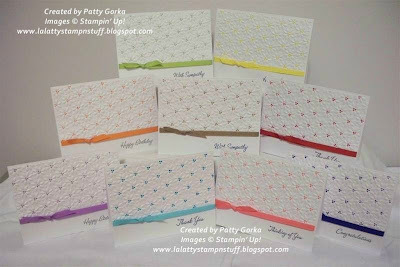 Patty,I would love to be a winner.especially to actually win one of your cards and see close up.I hope I win.These are just beautiful cards! Patty, Your blog is the first thing I visit when I'm on the computer. I just love all the beautiful cards that you make. You have really inspired me. Thank you for sharing your talent with us. Patty, Your blog is the first thing I go to when I get on the computer. I love all the cards that you do. You are such an inspiration to me. Thank you for sharing your work with us. Patty, The first thing I do when I get on the computer is check out your blog. Your cards are beautiful. You really inspire me. Thanks so much for sharing your talent with us. Karen I.
I love all of your cards - you do great work!! Thanks for sharing! These are just awesome!!! Don't you love when you find a quick and easy combo that come out so gorgeous!!?? Wow, these are beautiful!!! I would love to send these to OWH on your behalf... they would find great homes!!! 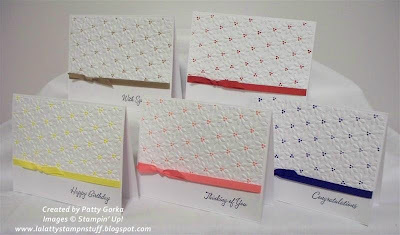 A friend of mine pointed me to these cards on your blog and I just wanted to let you know that I love the LO and the white on white with the embossed layer is just perfect! 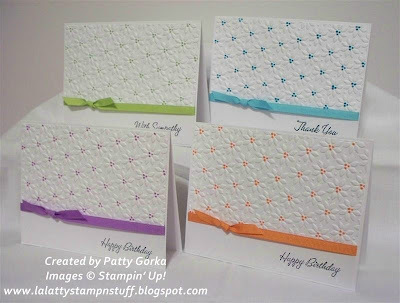 Love what you did with that embossing folder!! Lovely cards.. I guess i'm a bit late.. but better late than never.. You have a lovely style. Too bad I missed the draw but those are fantastic cards Patty! Those are wonderful cards Patty! Too bad I was too late to win but at least I can see how pretty they are.